Social Garden is a specialist property conversion firm, focused on generating and nurturing leads that move through the funnel and are ready to sign contracts. As a market leader in revenue performance management, Social Garden utilises big data, performance media and marketing cloud technology to dramatically improve sales and marketing efficiency and streamline the revenue creation process. Preparing for Digital Disruption in a Changing Property Market to be held on Wednesday April 27th in Melbourne. The aim of this event is to tackle the biggest problems facing the property industry right now. In such a volatile market, we are seeing trends that will either enable companies to usurp their competitors or cause them to be left in the dust. ● Specific use cases and applications for the property industry; & more. On the night, we’ll have a wide range of experts who will be able to answer your questions about utilising new technologies in your organisation and understanding specific use cases, as well as key speakers who will provide further insights. 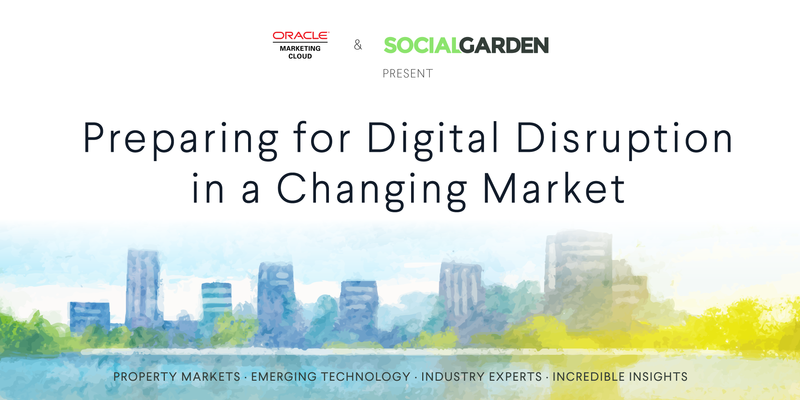 Among them are Mike Bird who is the CEO of Social Garden, Lora Djurdjevic the Marketing Manager of Woodlea (Australia’s fastest selling master planned community) and Nick Dennis, the Master Principal Consultant of Oracle Marketing Cloud Automation across APAC. Whether your company is a volume home builder or property developer, we’d love to have you there. Don’t miss out! The Urban Developer is proud to partner with Social Garden to deliver this article to you. In doing so, we can continue to publish our free daily news, information, insights and opinion to you, our valued readers.